The political death of Party leaders is a messy affair. It is often described as the politics of politics, but would be more aptly called the politics of the schoolyard. Rumours, tale telling, gossip, unknown terrors and side eyes are the order of the day. These are the things that bring political life into disrepute and keep it there. The replacement of Mr Abbott by Mr Turnbull was characteristically messy. Whatever of his political virtues and failings he never lacked courage and perseverance. And almost his last political decision was to welcome a large number of Syrian refugees into Australia. It was a generous gesture from a leader with whose policies many of us have frequently found fault for their narrowness. It was also generously endorsed by the Leader of the Opposition. This was a brief and welcome pause in many years of unrelentingly adversarial government. 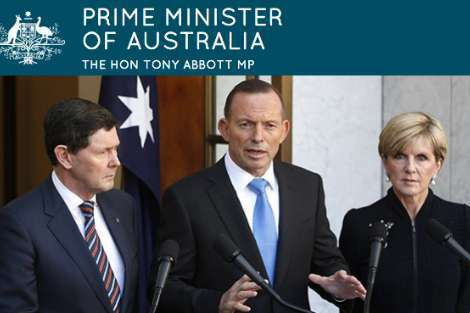 With two major exceptions the Abbott Government was not effective in implementing its policies. Even the two exceptions — stopping the boats and abolishing the carbon tax — have left dangerous rents in Australian public life. In budgeting, education and many other areas the Government has not been able to get its legislation passed. These failures cannot be put down to Mr Abbott alone. They have flowed out of the first Budget, which reflected the views of the Party as a whole. It embodied an economic ideology that rewarded economically successful individuals and penalised the vulnerable. Economic growth was prized for its own sake even when it further consolidated wealth in the hands of the very few. The Budget was reviled for its unfairness and blocked in the Senate. Perhaps the tragedy of Mr Abbott's Prime Ministership is that he adopted as his own a brutal economic ideology that ran counter to the Christian vision of his hero, Bob Santamaria. It is by no means clear that we should expect better from Mr Turnbull. He has given priority to economic development based on the free market. He has not made it clear how far that growth will be shaped by fairness and attention to the common good rather than to individual economic success. The major challenges that face Australia and its Governments of all stripes in the coming decade will be to reverse the increasing concentration of wealth in the hands of the very few and the consequent public alienation from politicians; to deal effectively and cooperatively with the effects of climate change; and to ensure that in responding to international crises the Australian community maintains a cohesion based on respect and on universal protection by the rule of law. The Abbott Government exacerbated each of these challenges. It is not at all clear that a Labor Government will address them effectively. Nor was Mr Turnbull's first view of his role as Prime Minister reassuring. But his instinct is for cooperative rather than adversarial government, and we should hope that this elicits a corresponding openness from Mr Shorten and within his own Party. That would be a good beginning. “It is by no means clear that we should expect better from Mr Turnbull.” Well said Andrew. It is not just the concentration of wealth in fewer and fewer hands alone that eats away at the Australian soul but the corrosive effect seemingly unlimited wealth has on those left behind looking on in envy. The economic system accepted in this country offers material rewards which are always just out of reach for the vast majority yet it would be contrary to the system’s own interests to encourage the majority to seek their fulfilment in human relationships rather than in what the system has to offer. I, for one, simply do not believe that Mr Turnbull even understands the problem let alone has any interest or ability in offering leadership. It is said "converts to Christianity make the best Christians". Mr Turnbull's musings to date indicate that this might well be true of him. Andrew, perhaps you are overly generous to Mr Abbott. Courage and perseverance could equally be interpreted as blindness and pig headed-ness with an underlying theme of (shirt-fronting) aggression. And generosity to Syrian refugees? Not his initial response. Andrew thank you. What a wonderfully balanced and reasoned piece. I dream of a government that creates an Australia "shaped by fairness and attention to the common good". Maybe then we can see that to be anything less is what is truly "un-Australian"
It seems to me that, by historical comparison with other such political changes in Australia, the Turnbull ascendancy over Mr Abbott was not especially "messy". It was made for expediency. In fact, if (in 2010) Ms Gillard had been capable of a speech with the lucidity and determination of the one which Mr Turnbull made on the day of his challenge, the electorate (not to mention the media) would have understood better (for all that the necessity for a leadership change in the ALP had been clearly apparent since the beginning of 2010). We are still waiting to see the degree to which the change from Mr Abbott (the "wartime leader", in the words of one of his colleagues) to Mr Turnbull is simply one of "packaging" (a "salesman with a smile", to quote Mr Albanese) or one of some substance. So long as priority is given to money (and for a rich man like Mr Turnbull that would involve some "cognitive dissonance"), it is hard to be optimistic about an enhanmcement of the overt values of the nation and its government). Thoughtful and respectful look at Tony Abbott's career. However, I will never forget the viscous and sustained personal attack on Julia Gillard in our Parliament. In all my years of studying and teaching about Australian Government, I never witnessed anything like it. He undermined public confidence in the operations of the Parliament itself. His treatment of Prof. Gillian Triggs was also reprehensible and cannot be ignored in any reflection on his career. He demeaned the great office to which he aspired and I do believe Bob Menzies would 'turn in his grave' at Tony Abbott's behaviour towards these two women. I agree with Jennifer's summation. For me the image of Uncle Tony being photographed beneath a demonstrators sign of "Ditch the Witch" is etched in my mind. At best, an unfortunate judgement about with whom to associate, at worst an endorsement of spitefulness. His kowtowing to shock jocks was more in the same vein. These are instances of him demeaning both the office of Prime Minister and, ultimately, himself. As Peter Costello remarked, there is really only one rule in the Liberal Party - winning. Once a number of his fellow Liberals could see themselves losing their seats, the tide changed. He had fair warning but espousing loyalty as a primary consideration relied upon it until the bitter end. That he maintains that the Liberal government would be returned under his leadership is deluded. Andrew Hamilton writes: "Whatever of his political virtues and failings he (Tony Abbott) never lacked courage and perseverance. And almost his last political decision was to welcome a large number of Syrian refugees into Australia." Those refugees were forced on Abbott, And his 2014 budget was a horror, titally unsympathetic to the less well off in our society, Andrew would better spend his time explaining why catholics have turned conservative . And why so many defend Tony Abbott . Is it tribal allegiance? Far from 'sparing a thought' for Tony ' in his humiliation, something he never managed to achieve in respect of those that he humiliated, we should ask ourselves what sort of party machine preselects and nurtures such a bunch of incompetent, unskilled, and ignorant men for public office. Wherever one looked in Abbott's cabinet, signs of understanding of their port-folio, wisdom in policy development, skill in negotiation and persuasion, or even common decency in dealing with fellow human beings, one could find nothing, except for the one woman, Julie Bishop.